Learn baseball skills from the Foxes players! 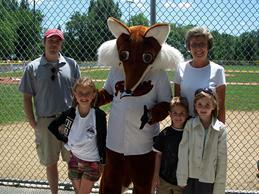 "Sly-der" is the official team mascot of the Fort Collins Foxes. Known to be a very friendly fox, Sly-der is the biggest fan of the Fort Collins Foxes. When he isn't cheering on the Foxes, Sly-der spends his time dancing the foxtrot, and planting foxgloves in his garden. Sly-der is currently single but does own a dog --- a fox terrier named Red. Sly-der loves to make appearances at schools, churches, clubs, etc. If you would like to have Sly-der make an appearance at your event, contact the Foxes by email.